Al-Hikam Tours takes groups to Masjid al-Aqsa (Jerusalem, Palestine) regularly through out the year. The groups are lead by scholars who also give guided tours to many of the holy sites in the holy land. Sites visited; Masjid al-Aqsa, graves of the companions, graves of the Prophets (Ibrahim, Ishaq, their wives, Musa, Yunus), Mountain of Olives & Mountain of Takbir. 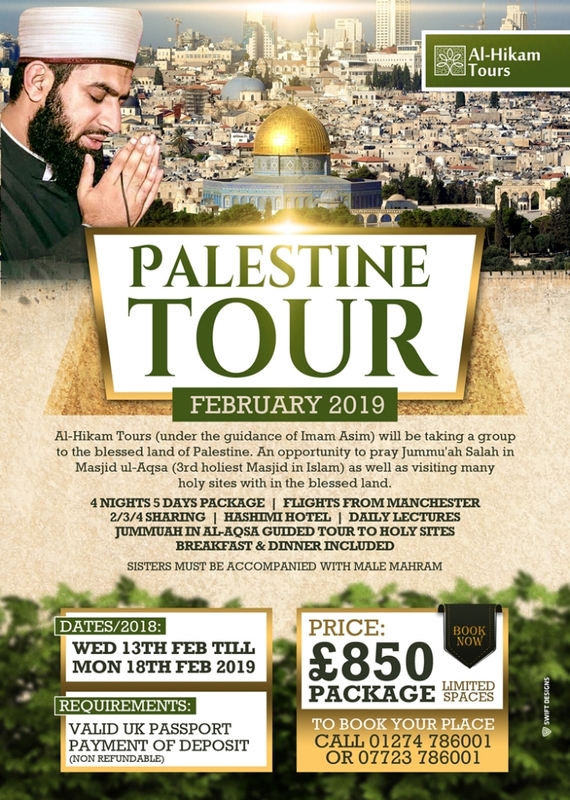 Al-Hikam Tours (under the guidance of Imam Asim) will be taking a group to the blessed land of Palestine. An opportunity to pray Jummu’ah Salah in the Masjid ul-Aqsa (3rd holiest Masjid in Islam) as well as visiting many holy sites with in the blessed land.